The IU Eskenazi Museum of Art will close its doors this coming May for summer renovations. One of the last exhibitions on display before the summer centers on Chinese culture, specifically the experiences of immigrants, through a variety of media including video, photo and installation work. “A Step in Time Across the Line: Recent Work by Chee Wang Ng” is the artist’s first solo museum presentation, according to the museum’s website. Judith Ann Stubbs, the Pamela Buell curator of Asian art at the museum, said the exhibit has received generally positive feedback from the public so far. Immediately inside the entrance to the special exhibitions portion of the museum hangs Ng’s first piece, titled “Griefless Peace.” An image of this piece can be found on the museum’s website along with additional information about the exhibit. Rows of Campbell’s tomato and chicken noodle soup cans stand stacked uniformly together with a single bowl of rice and matching chopsticks atop the middle cans. According to the website, this piece was largely inspired by Andy Warhol and his famous soup can photos with Ng’s infusion of Asian culture. 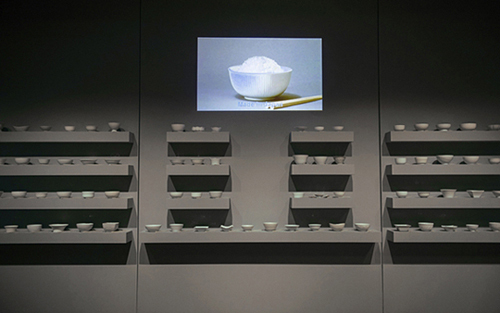 Another popular piece in Ng’s exhibit is “108 Global Rice Bowls.” Here, 108 porcelain rice bowls, all accompanied by a set of chopsticks, occupy multiple shelves on the museum’s wall. Overhead, a projector flashes a different picture of each of the bowls filled with rice in addition to captions indicating where each bowl was manufactured. This piece is more than just a visual experience. A chime signifies that a new image of a bowl is being projected on the wall, but these noises aren’t arbitrary. According to Ng’s website, each clang comes from each of the bowls in the display. Stubbs said this piece is probably her favorite because of the many different components in it. 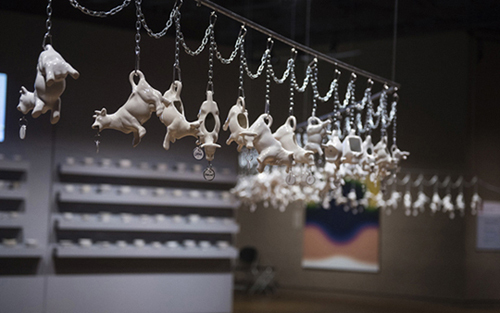 In the middle of the open exhibit room hangs the piece “In the Name of Our Forefather — Clear Tea, Light Rice.” Hanging by their tails on a metal chain alongside one another are 59 porcelain cow cream pitchers. Each pitcher has a tag indicating what country it is from. Some of the most popular places include China, Japan, France, the United States and Germany. Security guard Kevin Kleine said while monitoring the exhibit, he often sees people spend time with this piece. The other 59 creamers symbolize countries where Chinese individuals have immigrated over the years. While the room is lined all around with Ng’s photos, one of the last significant elements is “A Step in Time, Across the Line.” From small booties, to high heels, to life-size rain boots, this piece shows in detail, a variety of different ceramic shoes in different sizes and styles.